I am a big pastry girl. 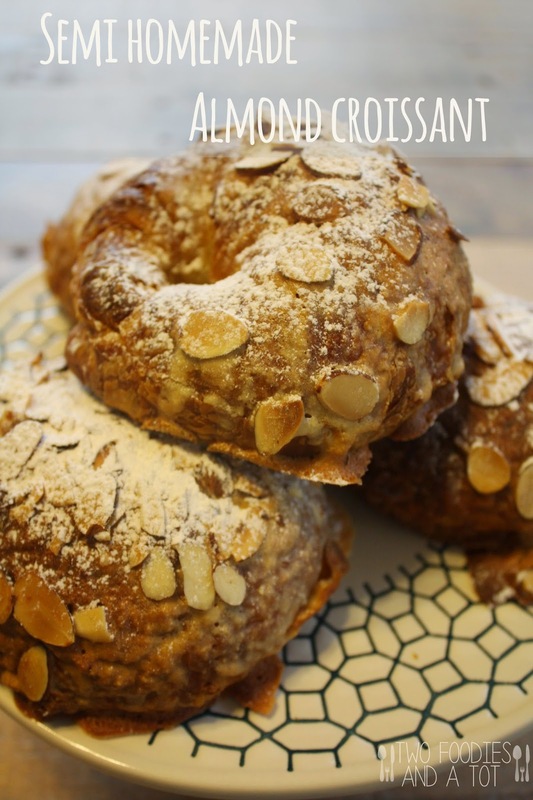 And almond croissant has always been one of my favorites. I was a music student. Everyday after school, I had to go to my music lesson and when I had a little extra time before my lesson, I used to stop at a bakery cafe and had a nice afternoon pick me up. I've never been a big snack person but I could not resist occasional afternoon pick me up. It's funny how something random like pastries somehow brings me back the memories from high school. Steve has always made fun of me for my love for cafes. Especially when we were dating. He'd be like, where should we go this afternoon? My answer was always, how about we decide sitting at a cafe? So, we have a beautiful pastry shop/cafe near us. I absolutely love everything from that place. I never buy any baked goods in bulk, knowing I can always stop at this pastry shop and get something fresh. But Costco happened last weekend. Yep, we love that place. Even though it's just Steve, I and the tot. Steve grabbed a package of freshly baked croissant that has 12 of them in it. I was tempted to stop him but I couldn't be bothered. Yeah, whatever, get enough croissant for a family of 6. So we ended up eating croissant turkey sandwish, breakfast sandwish the next morning and egg salad sandwich and so on. Steve really tried to make a point that 12 croissant was not too many for us. Well and the weekend's over. Now I was left with 6 more croissants. I had to do something about it. And the frangipane comes to rescue! 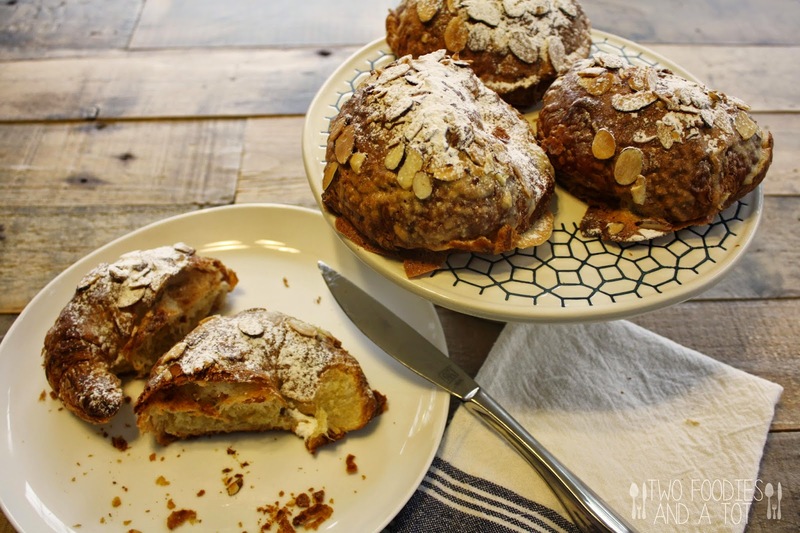 It's so easy to make these and gives leftover croissant a whole new life. I said a day old croissant in the recipe but I actually used 3 days old croissant.(YIKES!) Yes, it was stale but once it came out of the oven, it's like they're freshly baked. I made these after my tot went to school. 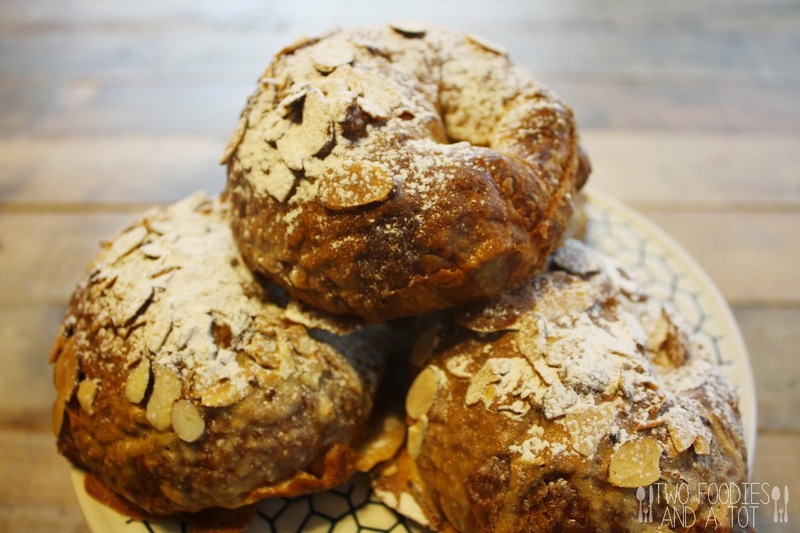 I enjoyed my quiet time as I was savoring every bite of this almond croissant, sipping my cup of tea in peace, planning the holiday menu while listening to Sam Smith and Jack Johnson. A weekday morning can't get any more relaxing than that. Frangipane is very versatile, a couple more recipes using frangipane on my blog is here. Blueberry frangipane tart, Fig and frangipane crostata. 1. Make simple syrup - in a saucepan, add water and sugar. Bring it to a boil on a medium heat(while stirring), until sugar's dissolved. Let it cool. 2. Heat the oven to 350F. Add all frangipane ingredients in a food processor and blend until it becomes smooth and pasty. 3. Cut the croissant lengthwise but not all the way, with the very end attached. Brush the syrup on both inside and outside top. 4. Spread frangipane inside of the croissant(about 2 Tbsp) and close. Spread some on the outside(about 1 Tbsp)and top with sliced almonds. 5. Bake in the oven for 20-25 minutes. You will see top and middle frangipane part becoming a little crusty. Let it cool for a few minutes. 6. Dust with confectioner's sugar and serve. *Frangipane recipe from Rebecca Franklin.